Size: Simply Huge! Tracks from False Entrance to Steep Point cover about 40km. Time to allow: 4 days minimum. To see and do everything without rushing 7-10 days is recommended. 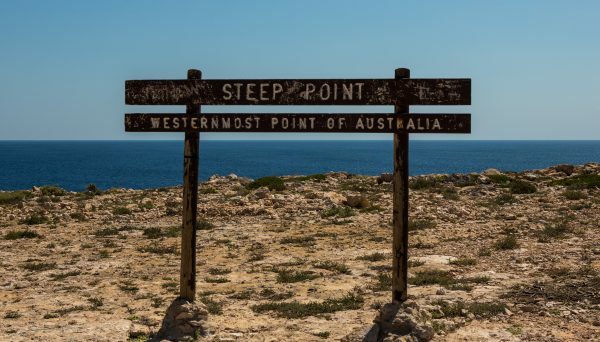 Steep Point is the westernmost point of Australia and that alone makes it worth travelling to. The sense of achievement getting to the westernmost point is rewarding in itself and the views on the way are spectacular. Steep Point is part of Edel Land which is in the shire of Shark Bay Western Australia. There are so many things to see and do on Edel Land. The “Zuytdorp cliffs”, Blow holes, Beaches, Reefs & Great Fishing. In order to get to all these places you will need a 4 wheel drive. This means it's not accessible to most people and there will very rarely be any crowds at any of these locations. The entire western side of Edel Land apart from two bays (False entrance and Cray Fish bay) is bordered by the mighty Zuytdorp cliffs which in some areas reach over 170m in height. 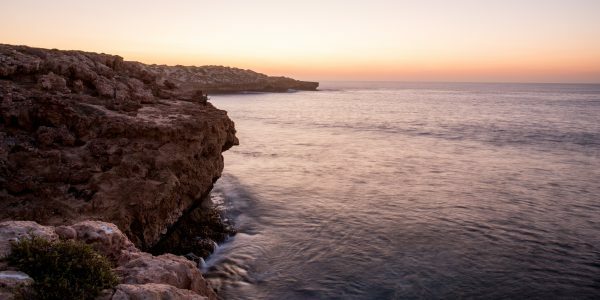 Every part of this coastline has different and spectacular views, every stop offers something different to see. Zuytdorp cliff at Steep Point. To get an idea of the height see the 4WD on top of the cliff left side of photo. Steep Point really gives the feeling of remoteness as there is very little or no phone coverage and it is far away from civilization. Travellers and campers must be self-sufficient when visiting Edel Land as there are no facilities or drinking water available. The westernmost point of Australia is a 40 km drive on soft sand from Useless Loop Road, 4wd is required the entire way with 20 psi tyre pressure at the most (this is clearly stated at the access point to the 4WD only area and the ranger will let you know when you book). 20 psi will reduce wear and tear on the 4x4 and sand tracks. Camping used to be allowed at Steep Point but is no longer allowed, however there are other areas where camping is allowed (see False Entrance or Shelter Bay for camping) and these camping areas are 5 - 40km from Steep Point. When you arrive at Steep Point on your 4x4 adventure there is a sign stating that you’re at the westernmost point of the country, from here you can clearly see Dirk Island. The southernmost bay on Edel Land is False Entrance; it's a beautiful bay with reefs the entire way along the shore. Swimming is not recommended at False Entrance due to the reef and potential dangerous swell. Beach camping and cliff camping is allowed at False Entrance. Be very careful when setting up tents as the wind changes on most days and can be very strong. If windy conditions are forecast during your visit I highly recommend using swags. The Steep Point ranger requires campers to bring their own fire pits, something like a 44 gallon drum cut in half or an internal steel barrel from an old washing machine or drier will make an excellent fire pit. Check for total fire-bans before planning your camping trip and 4x4 adventure. Sunset at False Entrance rock cliff fishing. Australia’s coastline stretches almost 50.000 kilometers and Steep Point is one of the best fishing spots in the country. Fishing at False Entrance is best done from the 2-10m cliffs. Fishing straight from the beach is possible however if chasing bigger fish it's best from those cliffs. For your own safety: If fishing from the cliff tie yourself to your car with a rope to avoid being washed into the water, it is a good precaution in case there is a big wave hitting the cliff or you slide on the ground. Driving along the beach at False Entrance is easy when using the right psi (16 psi seemed to work for us). 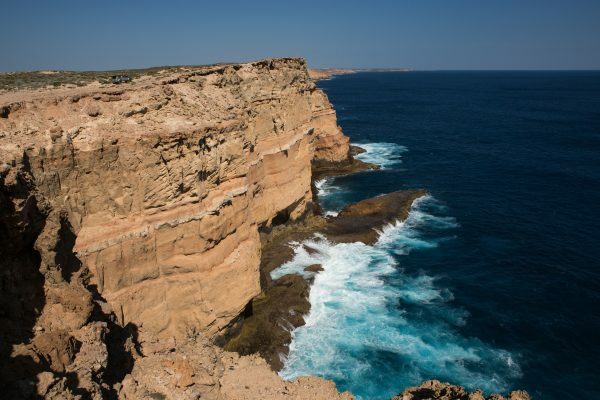 For more info on False Entrance cliffs and blow holes click here. The next bay north of False Entrance is Crayfish bay, half of the bay is covered in large flat rocks and the other half is just beach sand. The entire shoreline is reef just like False Entrance, so swimming is not recommended. If you are keen for a fun challenge, the drive from the northern end of Crayfish Bay to False Entrance along the sand dune track is a lot fun, this stretch of 4 wheel driving requires low range gearing the entire way. The track snakes behind a dune dividing the beach from the mainland and exits at the northern tip of False Entrance beach. From there drive along the beach until you reach the end where you can exit the beach between some rocks and sand dunes (see GPS waypoints for details). As far as we are aware there is no camping allowed at Crayfish Bay. Swimming in the shallow waters is fine along this stretch of the north east coastline as there are no reefs or cliffs along the entire shoreline. 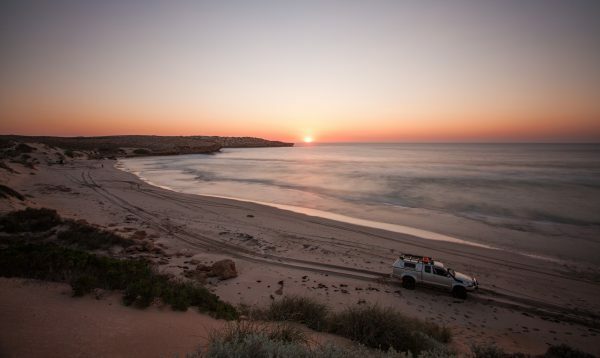 Camping is also allowed here and it is less than 5 km away from Steep Point and only 3 km from the ranger’s residence. This area is sheltered from the wind at most times and this is the reason it's called Sheltered Bay. If pitching up tents Shelter Bay would be the best option for camping on your 4x4 adventure. All camping gear, 10 liters of water per person per day, extra fuel, fishing gear, rated recovery gear, spare parts including vehicle fluids, tools, sun protection, insect repellent, fire pit & wood (unless fire ban is in place), lots of food, a well-supplied first aid kit & an emergency GPS locator. Basically campers at Steep Point must be self-sufficient and should have at least basic camping experience. Before your 4x4 adventure to Steep Point, visitors must contact the ranger and book a camping spot at either False Entrance or Sheltered Bay. It is advised that bookings are made well in advance of your 4x4 adventure especially if it's in peak season. A form must be completed and emailed or faxed to the ranger, followed by a phone call to prepay the camping fees. Leave 4x4 Adventure And Go To 4 Wheeling In Western Australia.